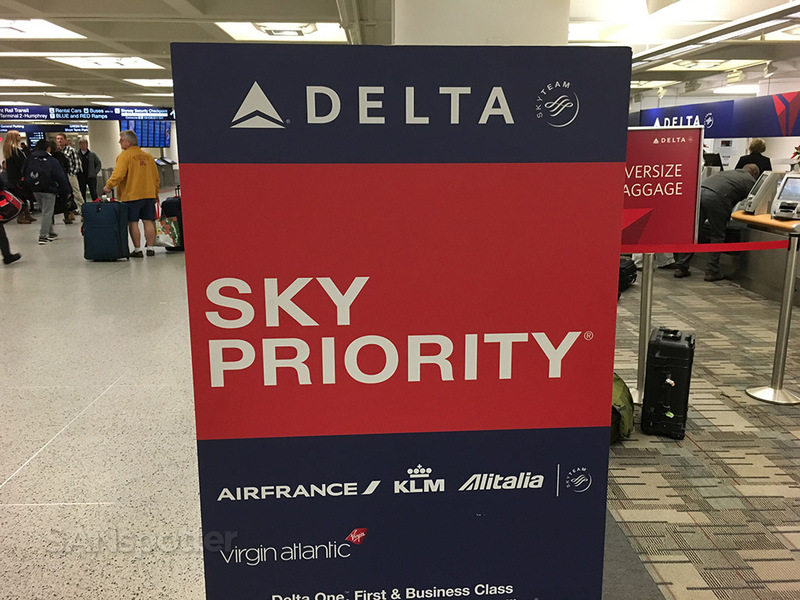 I consider myself to be somewhat of a seasoned veteran when it comes to Delta Airlines domestic first class, as they are usually the airline I take on my annual trips to Florida and back to visit family. 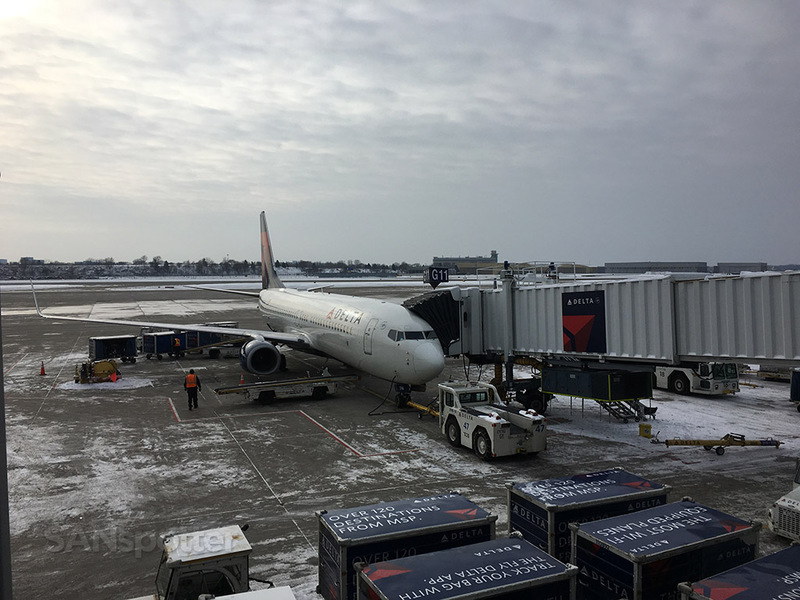 I was also a bit of a SkyMiles addict up until a few years ago, so more often than not I’d find myself in Delta first class whenever traveling around the US (like, say, to Detroit in the middle of January). 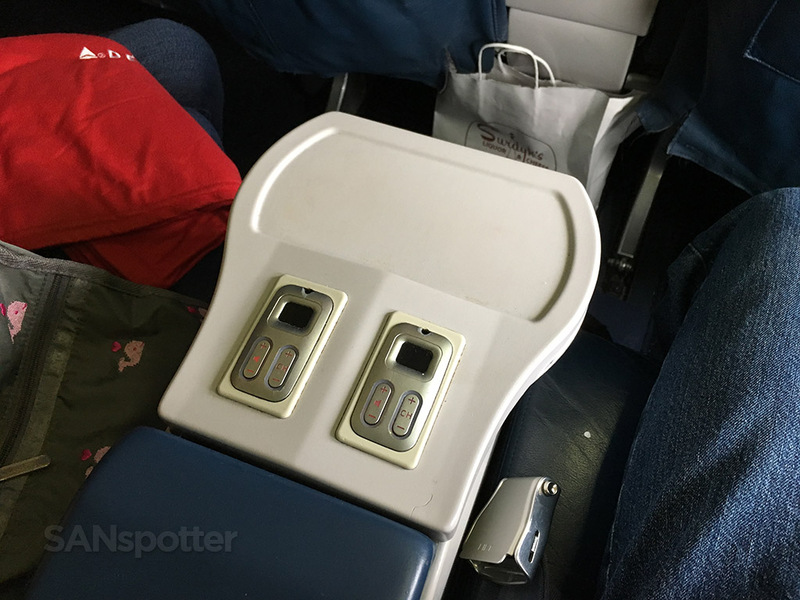 That being said, it should come as no big surprise that I wasn’t particularly excited about these two front-cabin jaunts I had with them today which would take me all the way home to San Diego. 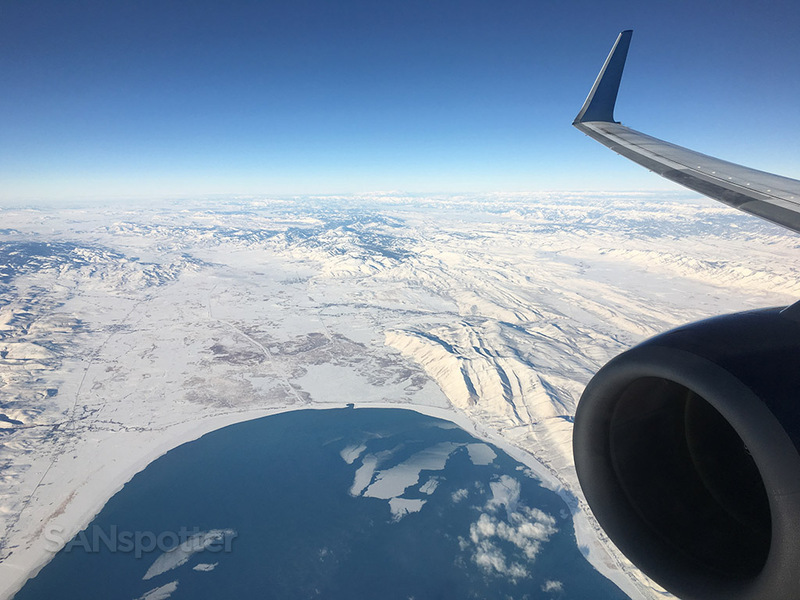 You’re probably asking why I chose an itinerary with a connection through Salt Lake City as opposed to one of the many nonstop flights out of MSP. Well, it all came down to timing. 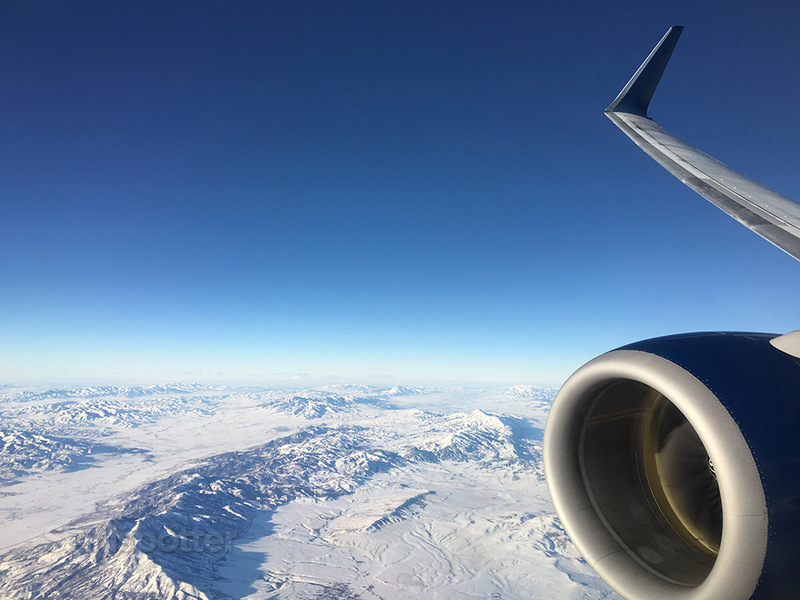 This particular itinerary was the most convenient in terms of departure and arrival times, so the connection didn’t really matter at all. 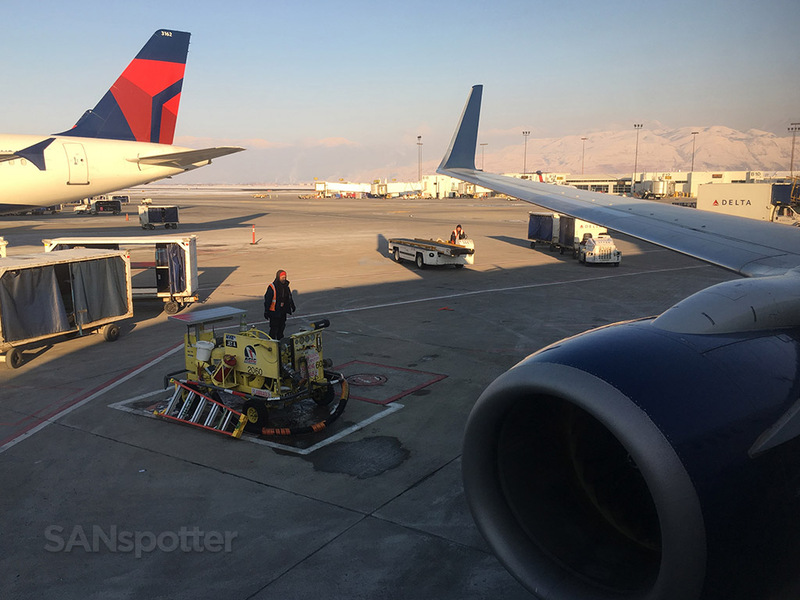 And besides – it’s been a long time since I’ve last transited through SLC, so I thought it would be fun to make a quick connection. 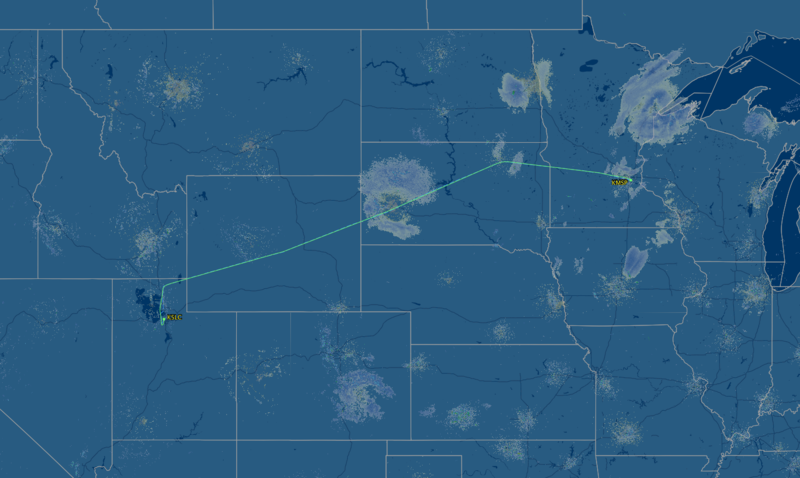 Yes, only a true aviation geek could think of a connection as being fun! 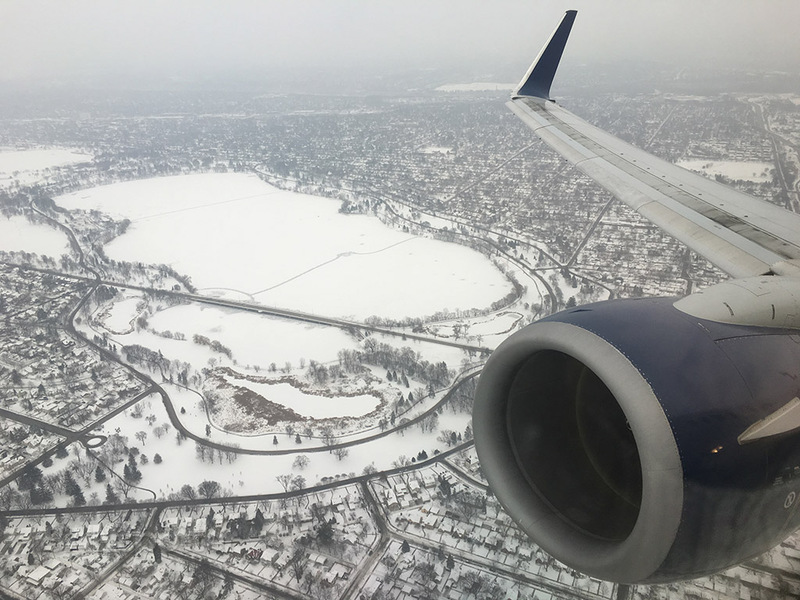 We arrived at MSP with plenty of time to spare, which made dropping off the rental car and checking in a stress-free experience. I’m particularly fond of the “downstairs” check in counters that are located in the underground tunnel between the tram station and the the escalators up to the main terminal. It’s usually not so crowded, and I’ve never had to wait in line to check in here. 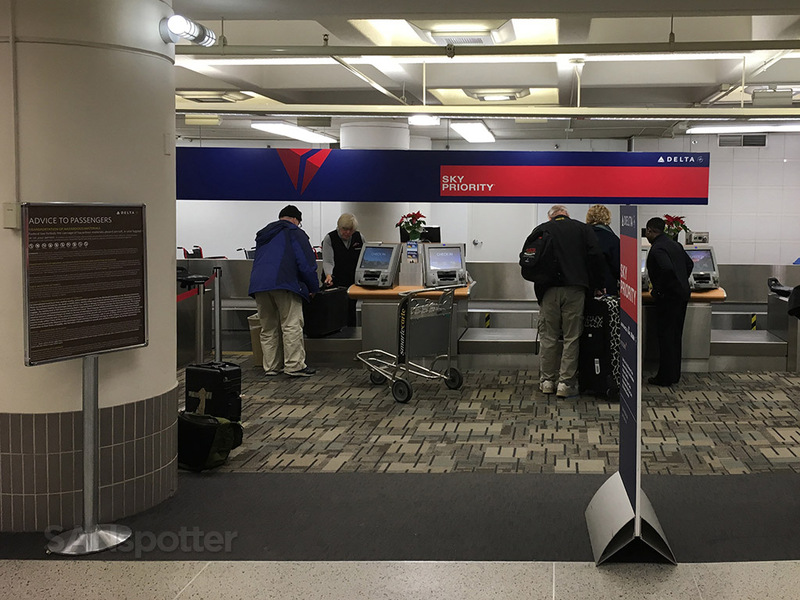 Check in is always a breeze with the Sky Priority lanes! By the time we finished doing a little shopping, grabbing a quick bite to eat, and walking to our gate, we only had to wait about 15 minutes before they started boarding. Our timing was perfect today! 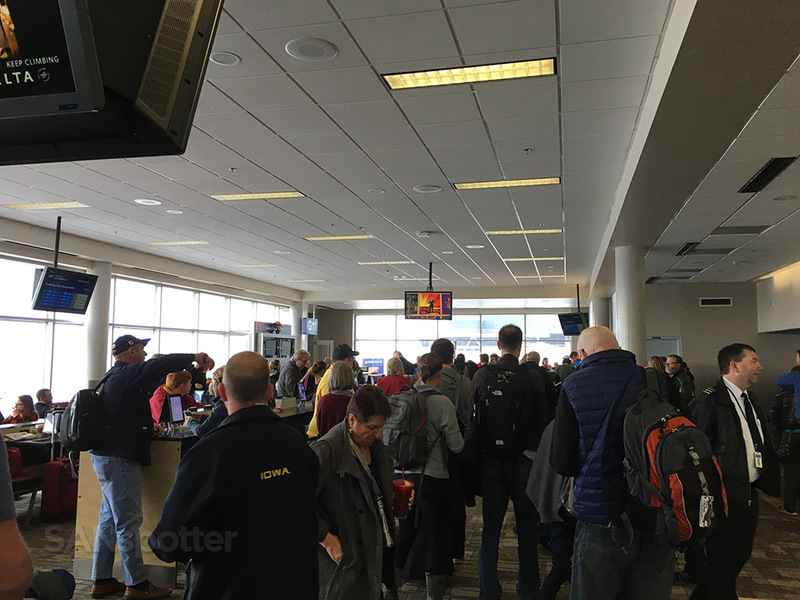 Standing room only just moments before they initiated the boarding process – a common occurrence at these particular gates, as they recently removed much of the seating in favor of adding more tables for an adjacent restaurant. Captive audience marketing at it’s finest! 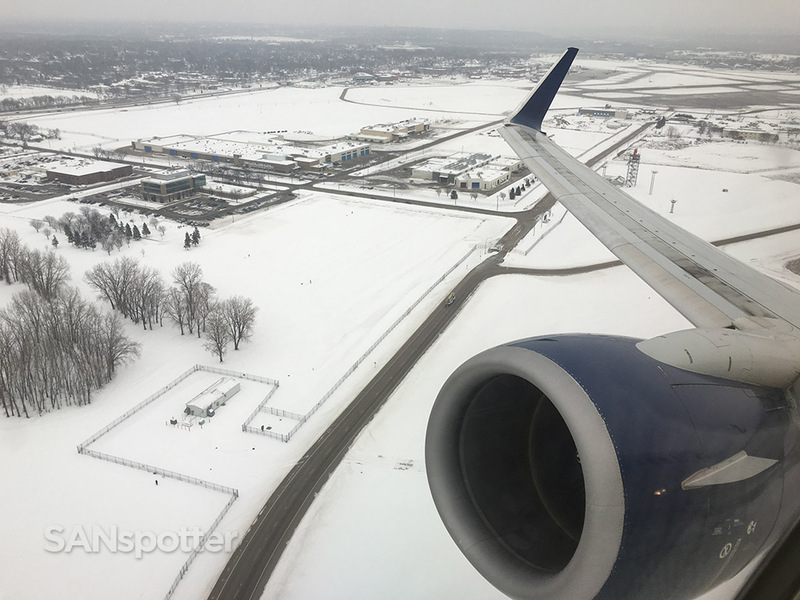 It was a pretty gloomy outside when we boarded the aircraft, and the mood in my head turned a bit gloomy as well when I saw that this particular 737-800 had not been updated with the new first class seats yet. 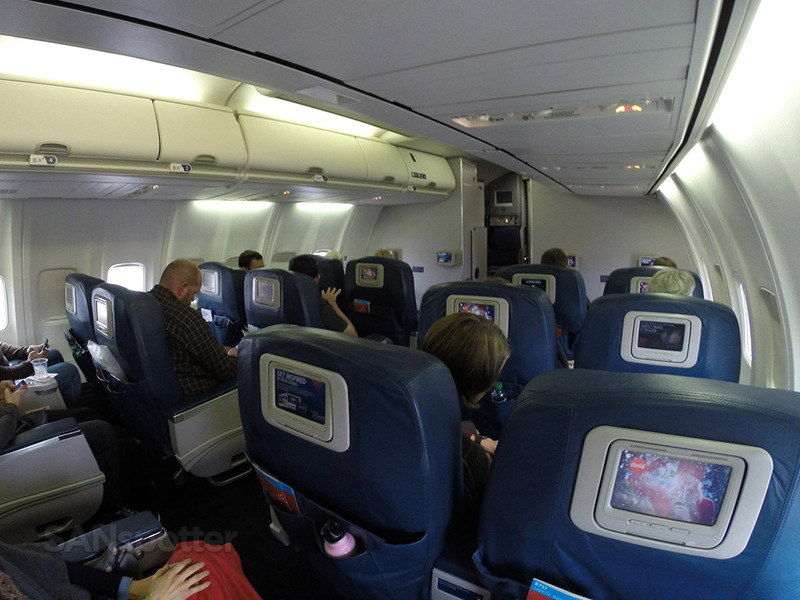 I’ve only flown one Delta aircraft with those new seats (an MD-88 from PBI to ATL last year), and they were quite good. I haven’t really been paying attention to their upgrade schedule, but I naturally assumed that most of the fleet would be updated by now. Oh well. 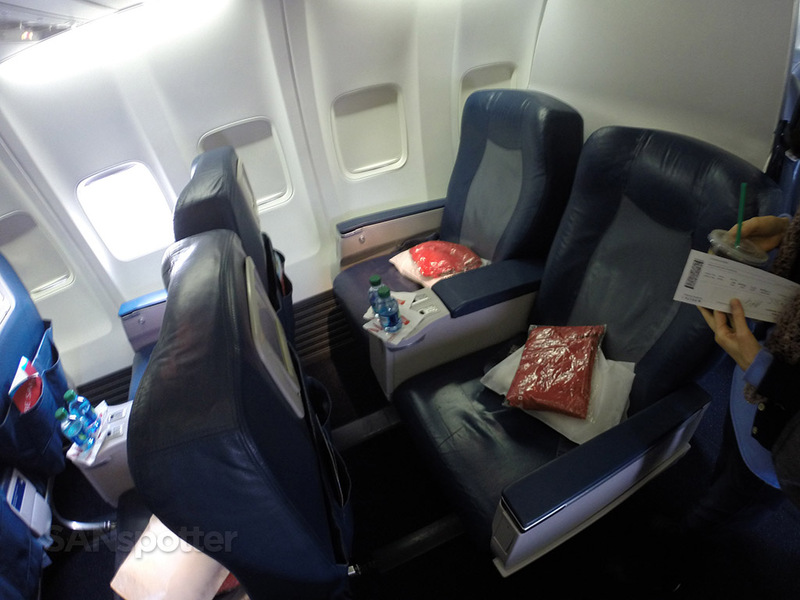 Just as I said in my recent review about the old Delta One business class product, I don’t mind reviewing the old premium cabins because it’s good to document for historical purposes down the road. 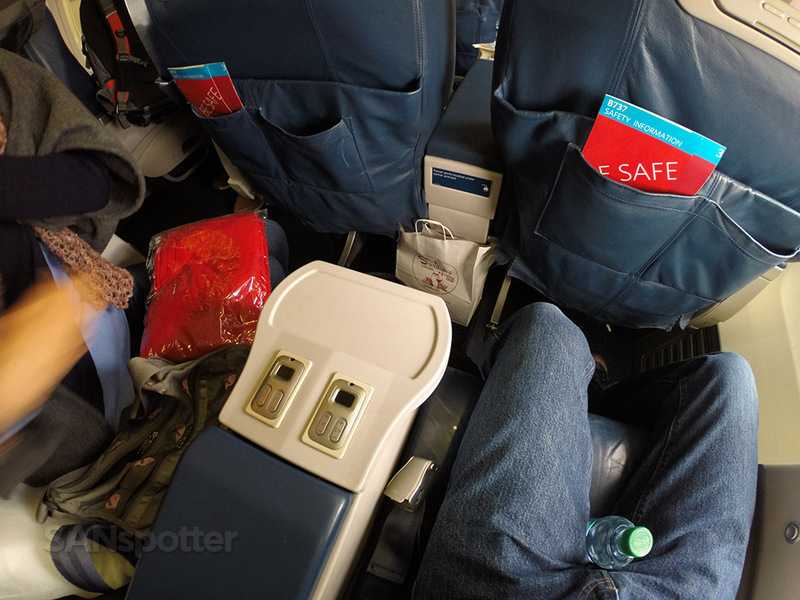 These seats will definitely be gone in the coming year or so, and it’ll be fun to look back and see how their domestic first class product has evolved over the years. 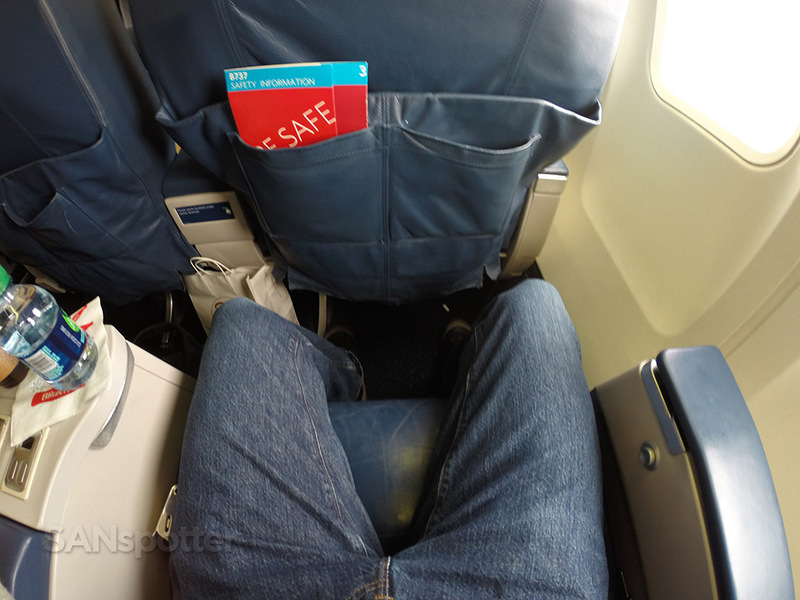 There isn’t a whole lot of leg room up here, so getting situated is always a bit of an ordeal. 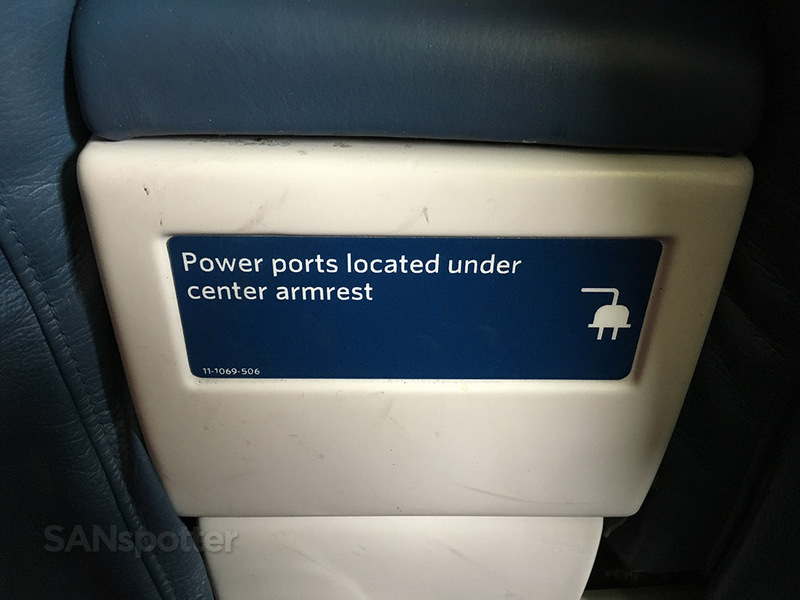 The center arm rest between the seats with basic audio controls and a large platform for beverages. 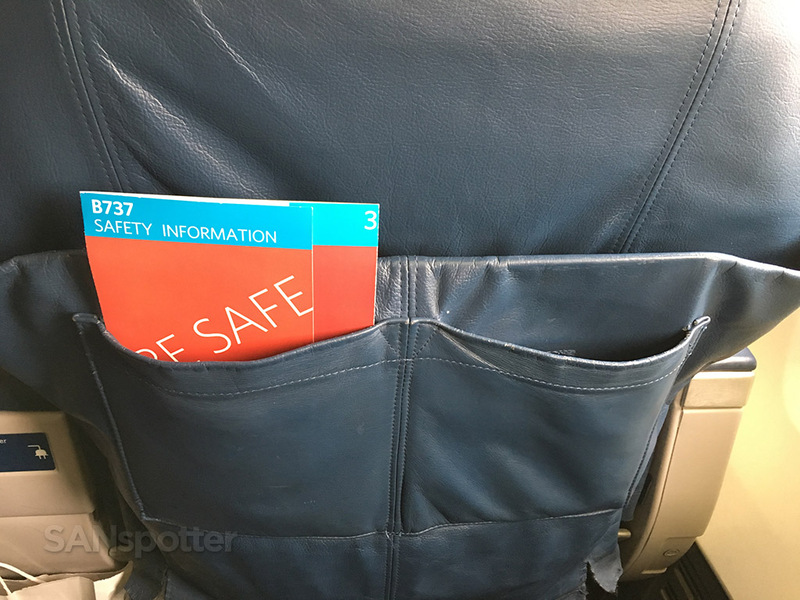 Saggy seat back pockets and worn leather give hints to the age of this particular first class cabin. 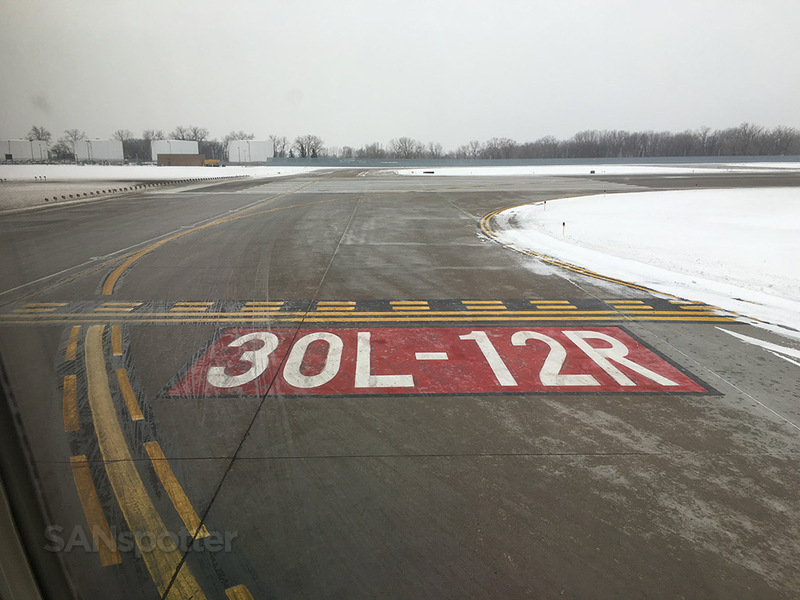 We rolled out to 30L under a gloomy (and snowy) winter Minnesota sky, and were up and on our way without any delay. 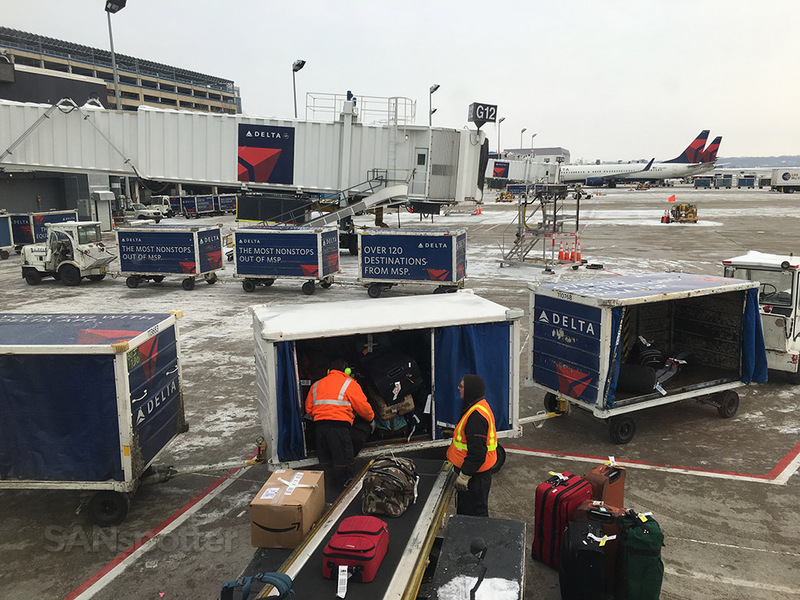 The Delta Airlines ground crew earning every cent of their paycheck today. It’s cold out there! Ready to rock n’ roll on 30L! Views like this take me back to my time growing up in Michigan. I miss it at times, but I’ll never live in a cold weather climate again. The cloud layer was pretty thick though and it took a while to break through and get our first glimpse of blue sky and warm sunshine. Finally! 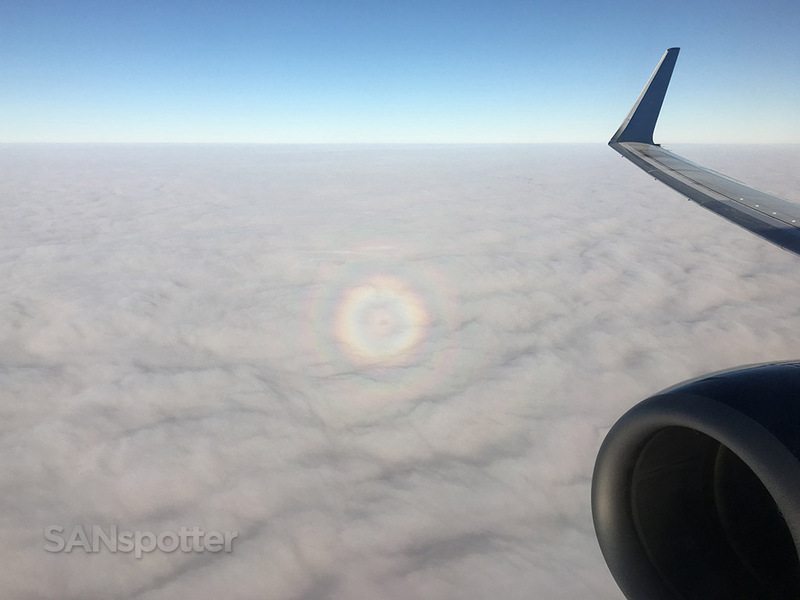 Sunshine, with the added bonus of our shadow surrounded by a rainbow. 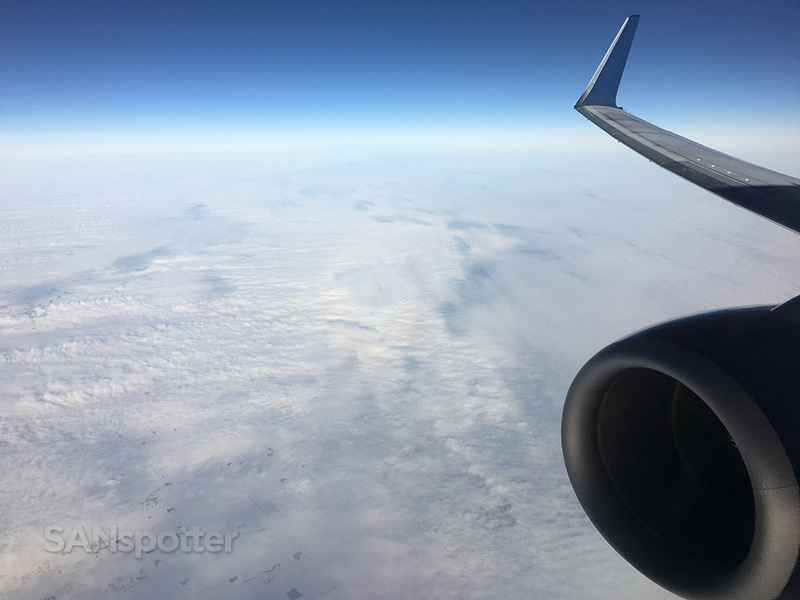 It’s not very often I get to see the northern plains covered in snow, so my nose was glued to the window for the first portion of the flight. 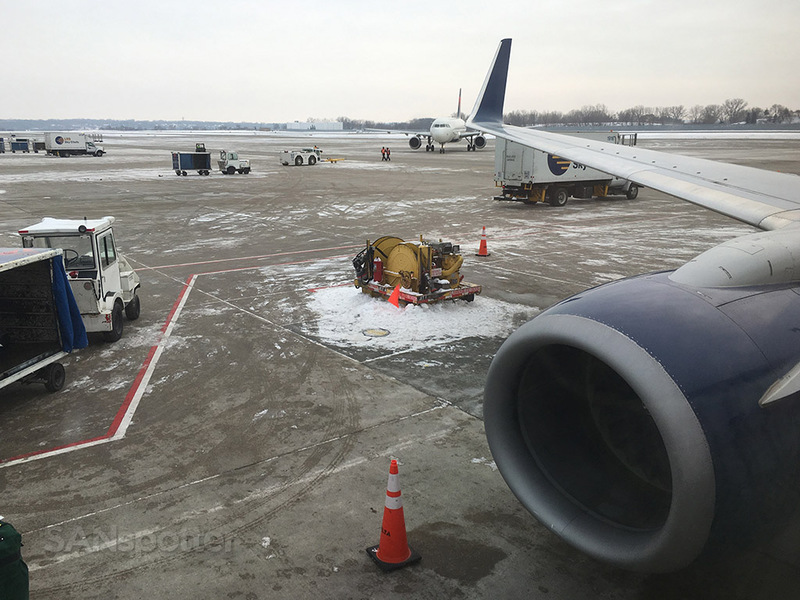 All in all this ended up being a very routine (and bland) short haul flight. 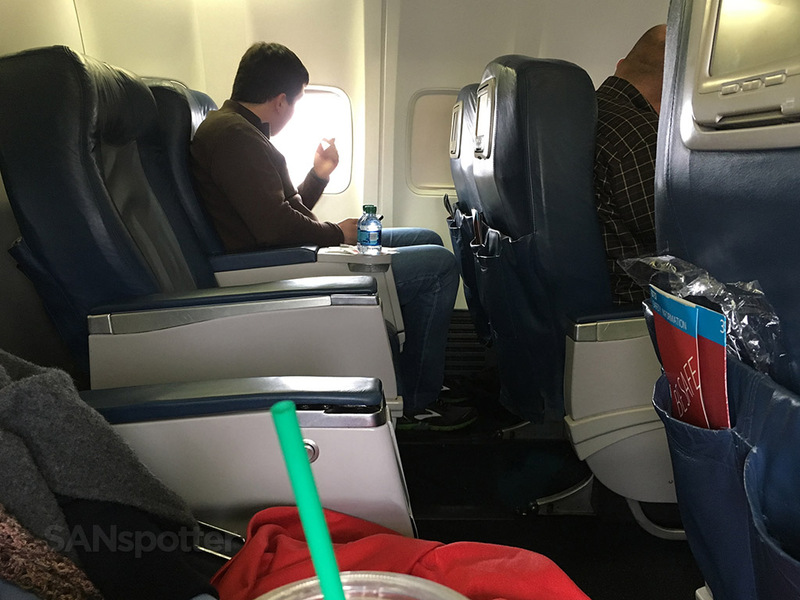 There was no meal service offered due to the fact it was only about two hours long, but the flight attendant came around with the snack basket several times and told us to “take all we want” each time. 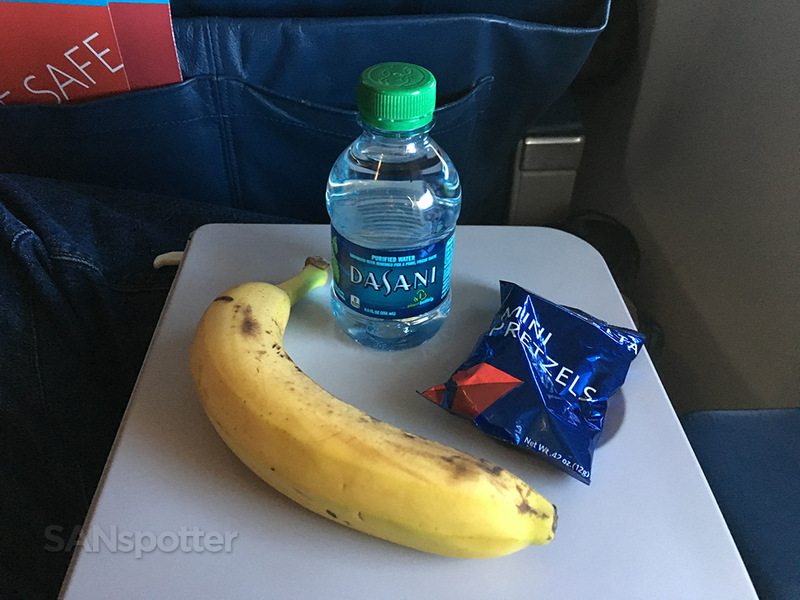 I wasn’t really hungry though, so a single bag of pretzels and a banana was all it took to satisfy me. 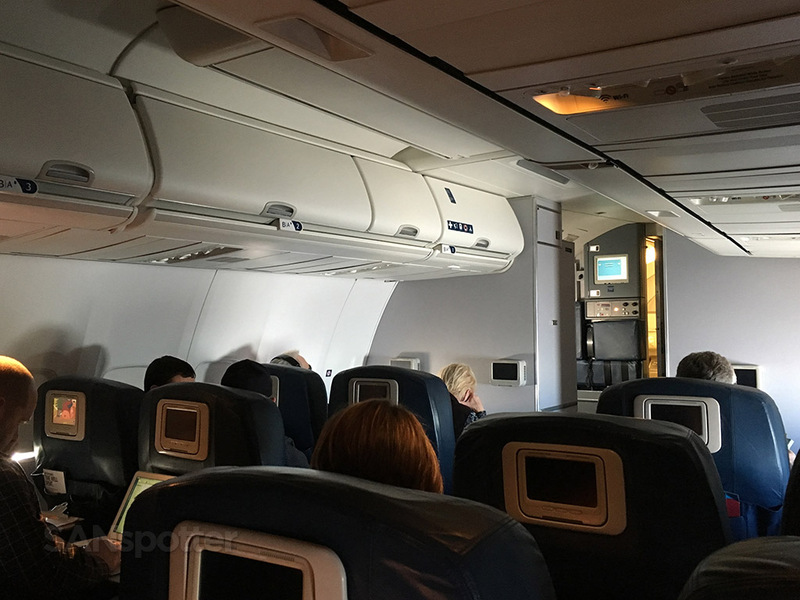 The scenery outside was beautiful, but most of the other passengers preferred closed window shades. 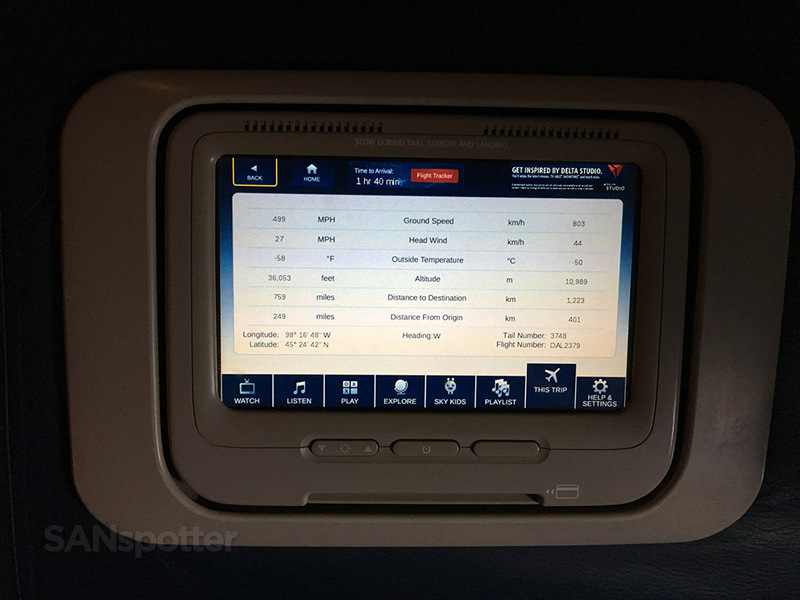 One of my favorite things about Delta Studio is the fact that the ship number is listed on the flight information screen. Pretty cool stuff for nerds like me. 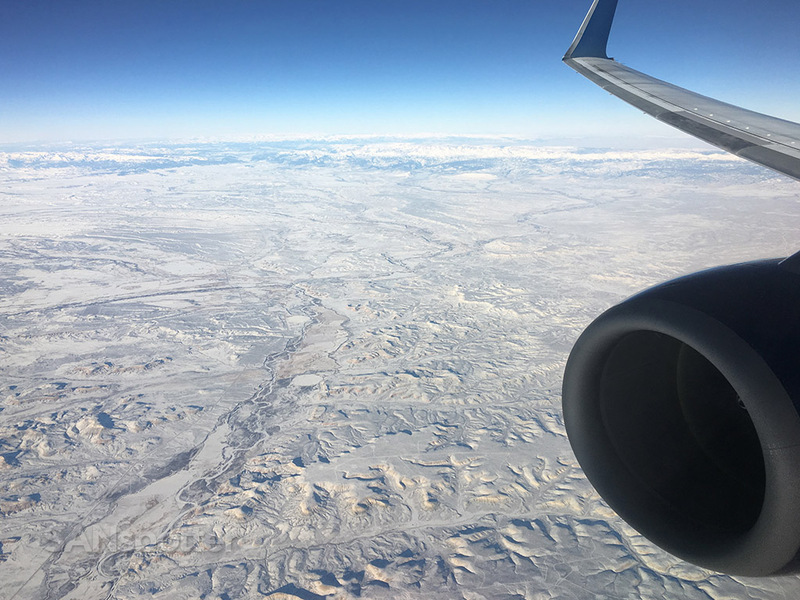 The terrain grew rugged and downright beautiful the further we pushed west, and I was crossing my fingers for a sunny and clear approach into SLC. 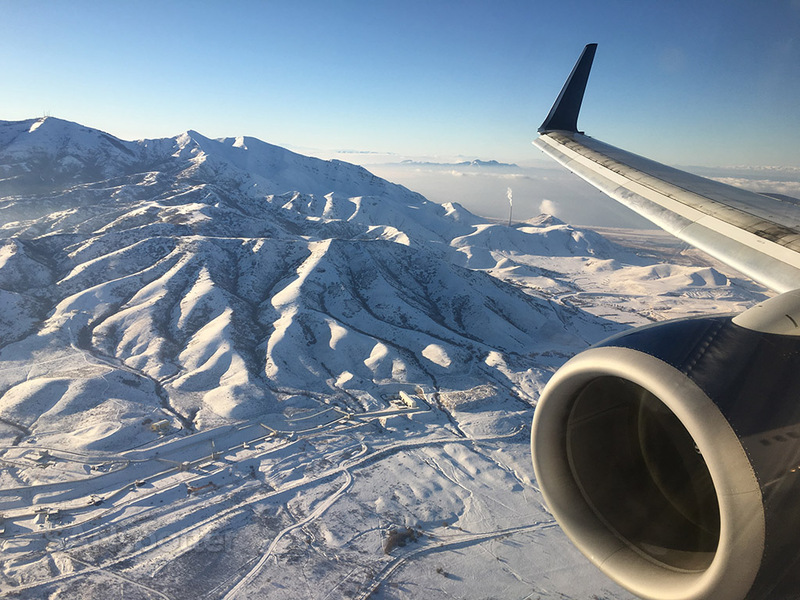 For those of you not familiar with Salt Lake City, I have two words for you: mountains and snow! It’s definitely one of my favorite cities in the US due to how rugged and beautiful it is. I spent a weekend here in 2005 just to have a look around, and I was really impressed with what I saw. I want to go back someday – preferably in the winter time to do a little skiing up in the mountains. 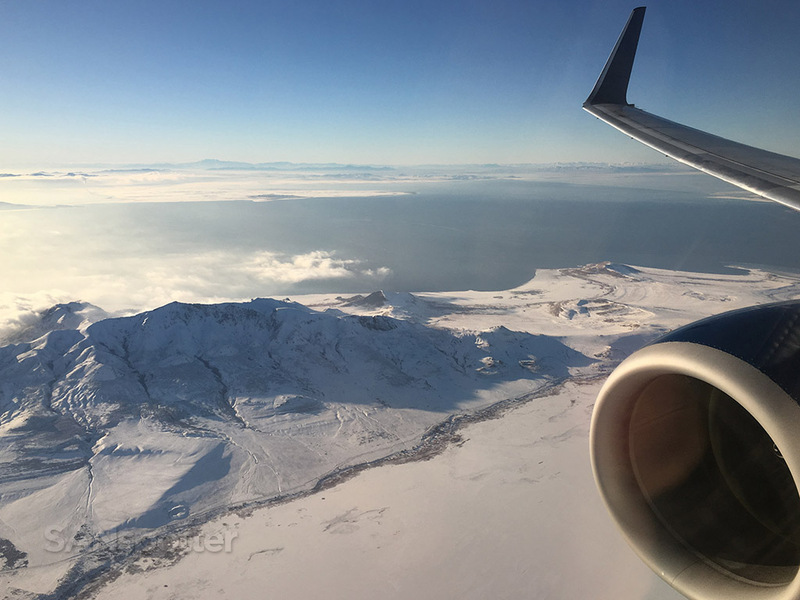 Mountains, snow, and deep blue skies – doesn’t get much better than this! 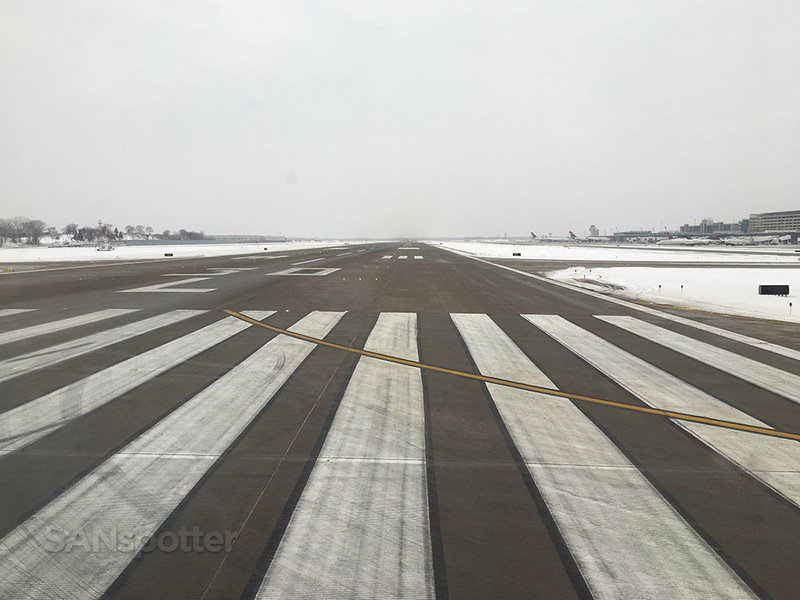 Upon touchdown, it was a short taxi over to our gate and we were unloaded in minutes.